The freshwater drum or sheepshead (Aplodinotus grunniens) is the only member of the Sciaenidae family which lives in fresh water. All the rest, including the prized red drum or red fish as commonly called, live in salt or brackish water. Although freshwater drum are fished commercially, their eating quality is only average. This is most likely why most sport fishers rarely target them. The tournament bass guys and walleye addicts loathe them, turning the air blue when they discover they’ve tied into one. Yet freshwater drum, like their red saltwater cousins, are big, strong, and vigorous fighters when hooked—great sport on the fly rod. Therefore, it’s understandable that fly fishers are increasingly turning their attention to them. In North America, freshwater drum are widespread east of the Rockies,particularly in the Great Lakes and their tributaries, as well as the St. Lawrence system. 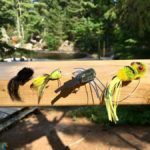 They’re omnivorous, opportunistic feeders, foraging on anything from mollusks, invertebrates, and baitfish, which explains why they’re often taken incidentally by bait and hardware anglers in pursuit of more popular species. 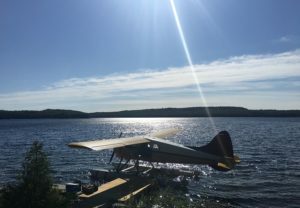 Most spawning takes place on sandy or gravelly bottomed shallows between late April and early June as soon as the water temperature gets above around 17 degrees. But some fish move into the lower stretches of rivers to spawn. Such is the case on my home river, the Moira. In the summer most drum can be found along the edges of deeper channels in shallow sand and gravel flats, especially close to the mouths of tributaries, where they can be spotted with their heads down nosing on the bottom for mollusks, especially zebra mussels (I’ve had fish regurgitate clumps of crushed and intact shells of the latter while I’ve been unhooking them). 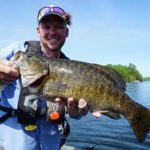 Some of the most productive Great Lakes drum locations are in southwestern Ontario, where a good friend who guides there has a number of regular clients who hire him to target them specifically. However, most of my own freshwater drum fishing takes place in the early season in the lower reaches of the Moira River. 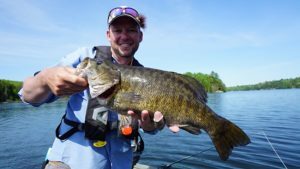 Although they do not protect their eggs as bass do, drum which have entered rivers to spawn will hang around close to the spawning areas in the early part of the season, and a few will even linger on well into summer. Drum frequently hold in the slower water of deep holes at the edges of the current, sometimes cruising the perimeter. 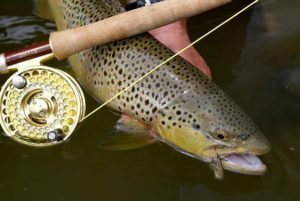 Although drum will hit a streamer fly swung in the current and retrieved back upstream, a big, impressionistic nymph or a Woolly Bugger, dead drifted through the hole, or retrieved slowly and erratically along or close to the bottom is usually more effective. Sometimes, fish can be found cruising slowly or gently holding position close to the bottom in relatively shallow water where the current is not too powerful, their ghostly, pale grey, bluish-tinged shapes making them easy to spot. I’ll often walk the bank looking for these prior to fishing. Sight fishing for these highly visible fish is both challenging and exciting. 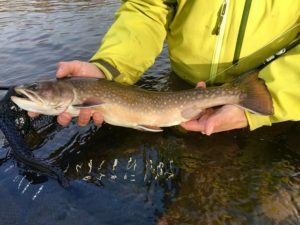 The best method is to cast far enough upstream with a weighted nymph to allow it to sink by the time it reaches the fish. Most of the time, you won’t be able to see your nymph, so it’s important to watch the fish closely. Be ready for any sideways shift from its holding position, or any sudden movement, especially of its head or mouth. Set the hook at the least sign that it might have taken the fly. If the fish is cruising, cast ahead of it so the fly sinks level with the fish just ahead of it. Often it will take on the drop. 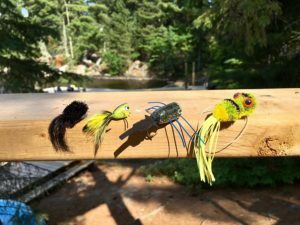 If you don’t get any action, try changing to a smaller fly, although these frequently attract opportunistic panfish and immature smallmouths. In the Moira, there are often other species (such as walleye, carp, gar and bass—or even a steelhead) holding in the same deep holes as drum. Consequently, the action can be delightfully varied. 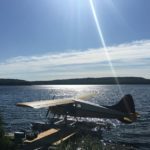 One day last May, I took a 10 pound plus freshwater drum, two largemouths of over three pounds, and steelhead of about eight pounds all from the same hole in just over an hour’s fishing. Because the drum you’ll encounter can run 15 pounds or more (although most of them will be between five and 10) and because there’s always the chance of a steelhead which will barrel downstream heading for the Bay, it pays to use a seven or eight weight outfit, with a wide arbour reel equipped with a good disc drag and plenty of backing. In the Moira, which is relatively shallow, I find a floating line is quite adequate, relying on a weighted fly or shot on the leader to get down to the fish. 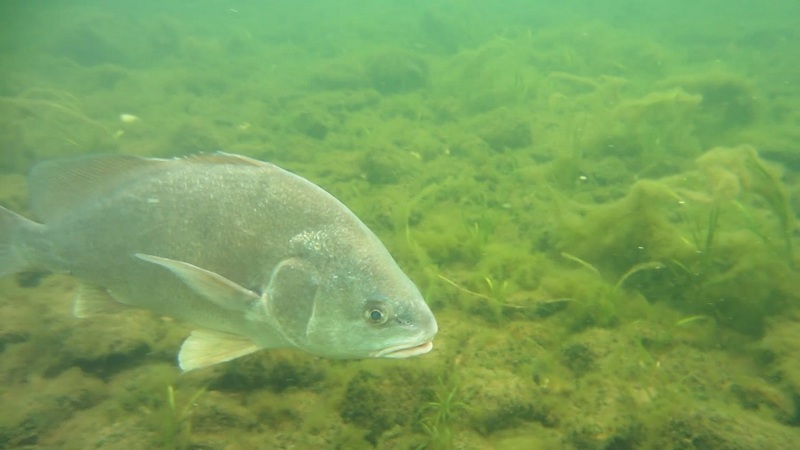 As they’re opportunistic feeders, freshwater drum are not particularly selective—although they can become preoccupied when browsing the bottom for mollusks. Patterns in natural colours are usually the most effective, such as brown, black, olive Wooly Buggers in sizes #6 – #2 with a touch of pearlescent or fluorescent red flash. Beadhead nymphs, in natural colours in sizes #10 – #6 are also good.